1. Heavenly Bundle Sling. This is a traditional hammock-style sling. I used it with Ethan when he was under two months old. I loved this sling while Ethan was small, but as he got heavier, it was not as comfortable for him or me because all of the weight was on one shoulder. After a certain point, Ethan didn't like to be held in the cradle position any more either. However, you can use the sling with many different positions and even with a toddler. I didn't because of the aforementioned comfort issue. Here is the Ethan sleeping peacefully in this sling. He is just a few weeks old here. Awww. I miss him being so tiny. Here's a run-down of the pros and cons of the Heavenly Bundle sling (and likely most hammock-style slings). Can be difficult to find the right size for you and this brand of sling is not adjustable. *I would like to note that you CAN use a hammock-style sling safely, although there have been some safety recalls lately. Use common sense and look at the tips on the Heavenly Bundle website to make sure you use this type of sling correctly and you'll be fine. 2. The Baby Bjorn Carrier. This is what I used with Ethan after he "outgrew" the other sling. It was oh-so-helpful on our trip to Colorado when he was 2 months old. He slept really well in it, and as soon as I adjusted the straps to fit me well, it was fairly comfortable to wear. But it can still hurt your back just as any backpack would. 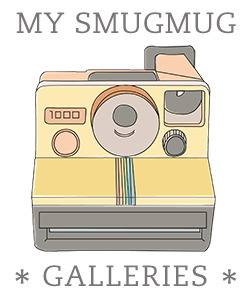 And it's pretty awkward to store or carry with you. 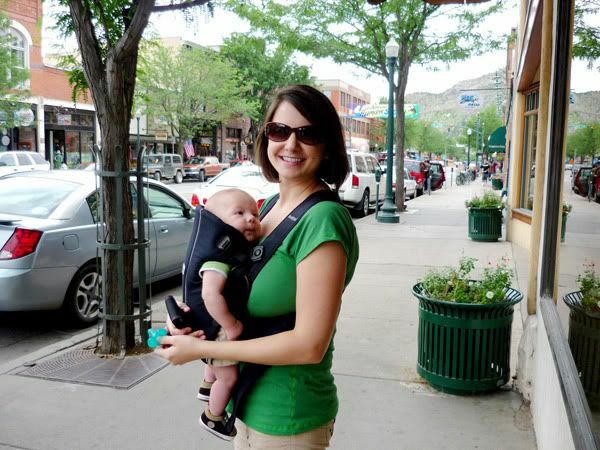 The Baby Bjorn pictured in action in downtown Durango, Colorado with Ethan at 2 months old. 3. The Moby Wrap. My mom gave me this as a shower gift when I was pregnant with Logan. I was interested because I'd heard so many great things about it and because I knew it would be important for me to have a versatile sling/carrier now that I'd have two kids to keep tabs on when we were out and about. And it turns out that I love the Moby Wrap. It is by far the most comfortable and versatile of the three slings/carriers. It distributes the weight well, does not cut into your shoulders or back, and the fabric has some stretch to it. It's not perfect (see below), but the pros far outweigh the cons in my opinion. 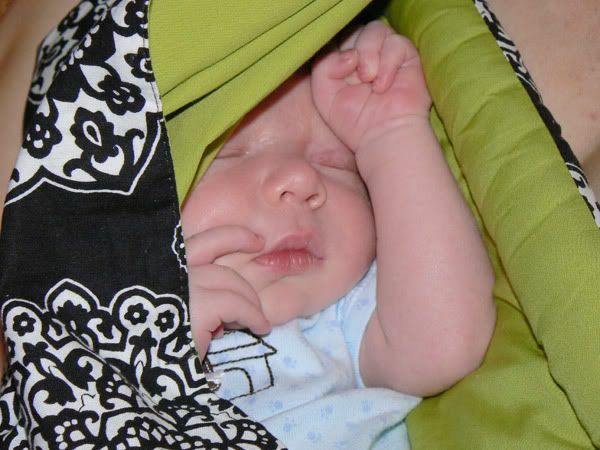 Logan tucked away in the Moby Wrap at about 5-6 weeks old. Now I use this same wrap technique with him facing out and he loves it. *Here's a tip if you plan on using the Moby wrap...because there is so much fabric to this wrap, I have found it so much easier to throw it on quickly before we leave to go somewhere (if I know I'm going to use it when we get there). This way, you're not draging the ends in the parking lot or other dirty place when you put it on (it does touch the floor while you are wrapping it around yourself). These are great run-downs. 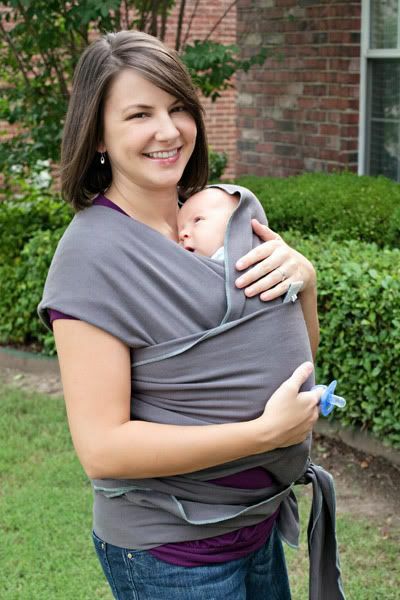 We have to Bjorn and, of course, the Moby Wrap from you! I can't wait to use the Moby wrap once all my pain is gone from the C-section. Owen loves to snuggle! I actually had a Moby Wrap with Kimberlyn but was too impatient to really learn how to use it. Looks like I should have spent more time learning. Dara let me borrow the Bjourn when I had Blake. It was great, but Blake (both my kids really) was so big I could not do it for long (considering I am small). I just did not have much luck. Oh well. We are doing well now. Great reviews! I loved my moby wrap too, but mostly used it at home since it was such a pain to put on elsewhere. Good thing for options! I think I need to retrain myself on using the moby wrap, since I now have a wiggle worm instead of a snuggly newborn. I loved it when he was teeny, though it did take practice, but the last time I put him in, he tried to escape! Thank you for your reviews! We have a baby k'tan, it's sort of a moby wrap that you don't have to wrap. It's awesome, but since I love baby gear, I frequent babysteals.com and saw the Heavenly Bundle wrap there for super cheap. I was humming and hawing and just googled for reviews of it. Your review made up my mind, since the k'tan and moby are so similar. If you like the moby better than the heavenly bundle, that makes up my mind. I'm sticking to the wrap style, especially since what I love most about it is the weight being distributed evenly on two shoulders. Thanks!